COME STAY AT THE NEW HORIZON COTTAGES! 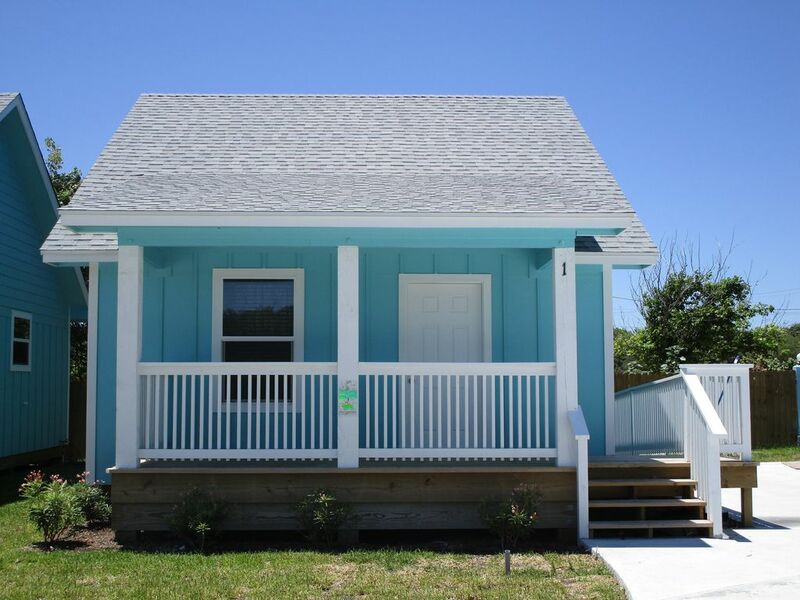 Horizon Cottages are conveniently located in beautiful Rockport! Minutes from Old Down Town, shops, marina and Rockport Beach. Our cottages are perfect for family vacations, reunions, couple's getaway or fishing trips. This one bedroom cottages is fully furnished. Furnishings include a queen size bed in the bedroom, sofa sleeper in the living room, fully equipped kitchen, washer & dryer and linens & bath towels. Internet and cable are also provided. Short drive the bay, docks and Rockport Beach. I stayed in Cottage #1. It was cozy, clean, and quiet at night...(traffic was loud during the day). This unit had everything I needed of all the comforts of home. Thank you, for the great hospitality. I will highly recommend these to my friends. Weather was not as ideal as we had hoped...cold,fog,rain but a few days were great. Enjoyed the walking paths throughout town. Seafood at several restaurants was fabulous! We would suggest that a little hat/coat rack by the front door and small night stands by the bed would be helpful. Also, bigger coffee pot. Accommodations otherwise we're very adequate. Thanks! The cottage was clean and had all the things we needed for a long weekend. the wifi was spotty, but that's my only complaint. We'll be back! Thank you for a great family vacation! We rented the one bedroom. Home is very nice, well taken care of and spacious. We will definitely be back! Thank you. Had a great time .... other than sheets not being clean it was great! The unit was very clean and management very easy to communicate with . Brand new, out of the way but close. Cozy spot, perfect for a couple. We were very impressed overall by the cottage. There were, however, a couple of issues that needed attention. There was a small stain on the sheets, not sure what that was, and a few loose hairs on the fitted sheet as well as the pillow. We just went to the dollar store and bought a set of new ones and put them on. There was no hand soap in the bathroom and no hair dryer. We picked up some hand soap when we got the sheets and, for once, remembered to bring a hair dryer just in case. Although there were not many dishes to choose from it was sufficient for what we needed. The whole structure was new as were the appliances. A/C blew cold and the shower was great! We will definitely be back! !